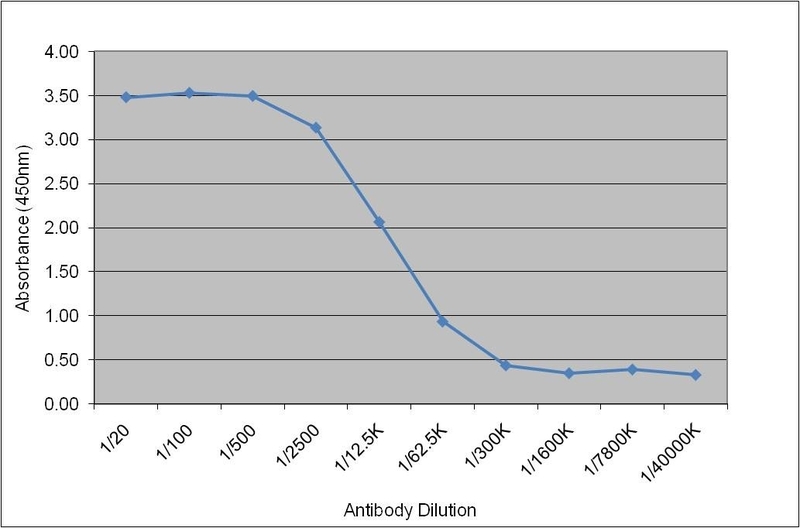 Bovine lipoprotein lipase detected with Mouse anti lipoprotein lipase antibody, clone 5D2 (MCA5641) followed by Rabbit F(ab')2 anti Mouse IgG:HRP (STAR13B). Bovine lipoprotein lipase detected with Mouse anti lipoprotein lipase:HRP (MCA5641P). Mouse anti lipoprotein lipase antibody, clone 5D2 recognizes an epitope within amino acids 380-410 of lipoprotein lipase (LPL), a member of the AB hydrolase superfamily, which plays a pivotal role in lipoprotein metabolism and transport, acting as the key enzyme in the hydrolysis of triglycerides and very low density lipoproteins (VLDLs), and the release of free fatty acids into peripheral tissues. A deficiency of LPL can result in hypertriglyceridemia, and many studies have focused on the critical role which LPL plays in the pathogenesis of atherosclerosis, and in particular the relationship between LPL and apolipoprotein E (ApoE), both of which are secreted in significant amounts by macrophages in developing arterial wall lesions. 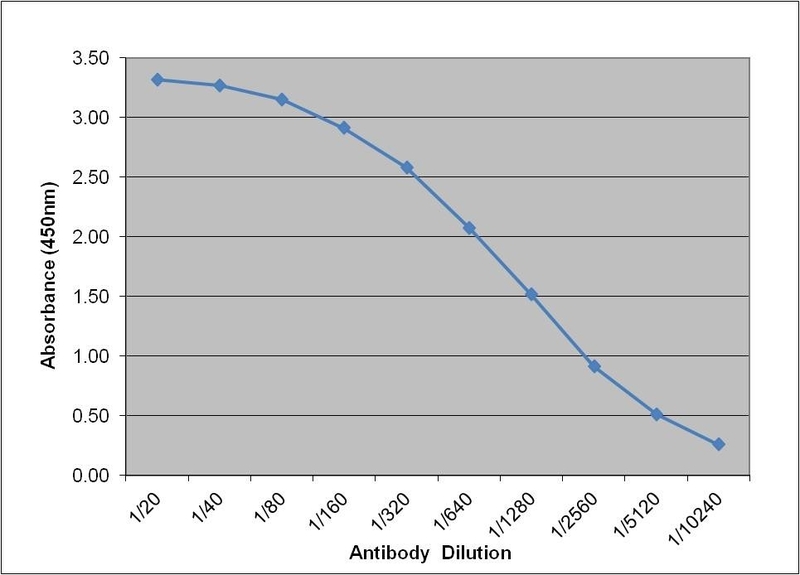 Mouse anti Lipoprotein lipase antibody, clone 5D2 is a unique antibody which differentiates between monomeric inactive and dimeric active LPL, and binds to LPL sequences involved in LPL, LPL receptor, and heparin interactions. Mouse anti Lipoprotein lipase antibody, clone 5D2 has been shown to inhibit the activity of human LPL (Chang et al. 1998). Purified bovine milk lipoprotein lipase. MCA5641B can be used in a direct ELISA, or as the detection reagent in a sandwich ELISA with MCA5641 or MCA5641GA as the capture antibody. MCA5641P can be used in a direct ELISA, or as the detection reagent in a sandwich ELISA with MCA5641 or MCA5641GA as the capture antibody. MCA5641EL can be used in an indirect ELISA, or as the capture antibody in a sandwich ELISA with MCA5641B or MCA5641P as the detection reagent. MCA5641 can be used in an indirect ELISA, or as the capture antibody in a sandwich ELISA with MCA5641B or MCA5641P as the detection reagent. MCA5641B detects a band of approximately 53kDa using partially purified LPL from postheparin plasma. MCA5641P detects a band of approximately 53kDa using partially purified LPL from postheparin plasma. MCA5641EL detects a band of approximately 53kDa using partially purified LPL from postheparin plasma. MCA5641 detects a band of approximately 53kDa using partially purified LPL from postheparin plasma. Peterson, J. et al. (1992) Human lipoprotein lipase: relationship of activity, heparin affinity, and conformation as studied with monoclonal antibodies. J Lipid Res. 33 (8): 1165-70. Chang, S.F. et al. (1998) Detailed characterization of the binding site of the lipoprotein lipase-specific monoclonal antibody 5D2. J Lipid Res. 39 (12): 2350-9. Hussain, M.M. et al. (2000) High affinity binding between lipoprotein lipase and lipoproteins involves multiple ionic and hydrophobic interactions, does not require enzyme activity, and is modulated by glycosaminoglycans. J Biol Chem. 275 (38): 29324-30.